A former Royal Navy World War I and Royal Australian Navy World War II veteran, Claude’s life spanned the existence of the Australian Navy, which came into being on 1 March 1901, only two days before his birth. Born in Pershore, England on 3 March 1901, Claude Stanley Choules joined the Royal Navy as a Boy on 10 October 1916, and served in the training ship HMS Impregnable situated at Devonport dockyard. The Impregnable had been a 140 gun square-rigged wooden battleship prior to becoming a training ship. In 1917, Claude joined the battleship HMS Revenge, flagship of the First Battle Squadron. While serving in Revenge, Claude witnessed the surrender of the German High Seas Fleet at the Firth of Forth, in November 1918, ten days after the Armistice. He also later saw the scuttling of the German Fleet, by the Germans, at Scapa Flow. In 1919 he saw service in Revenge in the Black Sea which was a tense period with the Russian Civil War still taking place and Turkish Nationalists fighting to gain control of their country after the collapse of the Ottoman Empire. A ‘big ships man’, Claude then served in the battleship Valiant with the Mediterranean Fleet between 1920 and 1923. A subsequent posting saw him stand by the construction of the RN’s first purpose built aircraft carrier HMS Eagle, which was followed by a two year posting as a Petty Officer on board Eagle, again in the Mediterranean Fleet. In February 1926, along with eleven other RN senior sailors, Claude came to Australia on loan as an Instructor at Flinders Naval Depot. Taking a liking to the Australian way of life, Claude decided to transfer permanently to the RAN. On 3 December 1926 he married Ethel Sim Wildgoose at the Scotch Church in Caulfield, Victoria and they later had two daughters and a son. 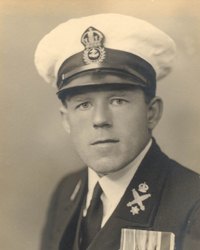 After returning England for courses to qualify for Chief Torpedo and Anti Submarine Instructor, Claude stood by the building of the RAN’s heavy cruisers HMA Ships Australia (II) and Canberra. Claude was a commissioning crew member of HMAS Canberra (I) and served in her until 1931. Claude took his discharge from the RAN in 1931 and the family moved to Western Australia. In 1932 he rejoined the Navy as a Chief Petty Officer Torpedo and Anti Submarine Instructor at the Naval Training Depot in Fremantle. During World War II, Claude was the Acting Torpedo Officer, Fremantle and also the Chief Demolition Officer for Western Australia. Early in the war Claude was flown to Esperance, on Western Australia’s southern coast, to identify a mine washed ashore nearby. The mine was identified as German and Claude then disposed of the first mine to wash up on Australian soil during WW II. As the Chief Demolition Officer, Claude had the task of destroying facilities and oil storage tanks in Fremantle harbour thus rendering them useless in the event of a Japanese invasion. For a number of weeks during the dark days of 1942, explosive charges were in place to carry out this task. Additionally Claude had depth charges placed in ships, that had been unable to sail to Albany, with the intent of sinking them in Fremantle harbour should the Japanese invade. Claude remained in the RAN after the war and transferred to the Naval Dockyard Police (NDP) to allow him to remain in the service until March 1956, as retirement from the RAN for ratings in those days was at 50 years, while personnel could serve in the NDP until the age of 55. Claude was awarded the Queen Elizabeth II coronation medal in 1954 for his long service to the RAN. After retirement from the Naval Dockyard Police, Claude purchased a cray fishing boat and spent many years fishing off the Western Australia coast. Claude Choules died in Perth, WA on 5 May 2011, aged 110, and was acknowledged as the last veteran, who had seen active service, from World War I. On 13 August 2011, Prime Minister Julia Gillard and the Minister for Defence Stephen Smith (also Member for Perth) announced that the recently purchased vessel, the Royal Fleet Auxiliary Largs Bay would be renamed HMAS Choules. HMAS Choules was commissioned, in Fremantle, on 11 December 2011.